This hotel was completely renovated in 2004 and has the Sanctuary of Fatima at the doorstep, so you can park your car in our garage and walk to the shrine! 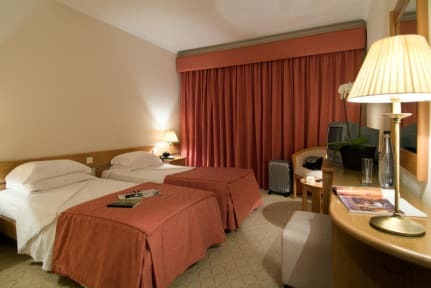 The hotel is fully equipped for you to have a great stay in Fatima. Rooms are all equipped with complete bathroom/WC, hairdryer, direct phone, air-conditioning, TV (satellite), electronic door locks and central heating. Some have a balcony. We provide a bar and TV rooms, as well as an internet kiosk, and an internet wireless hotspot, in case you bring your laptop.